With the election gearing up and the national spotlight trained on New Hampshire, Pam Clark will be working hard along with other Rights & Democracy and Monadnock Progress Alliance members to make sure our concerns are front and center. 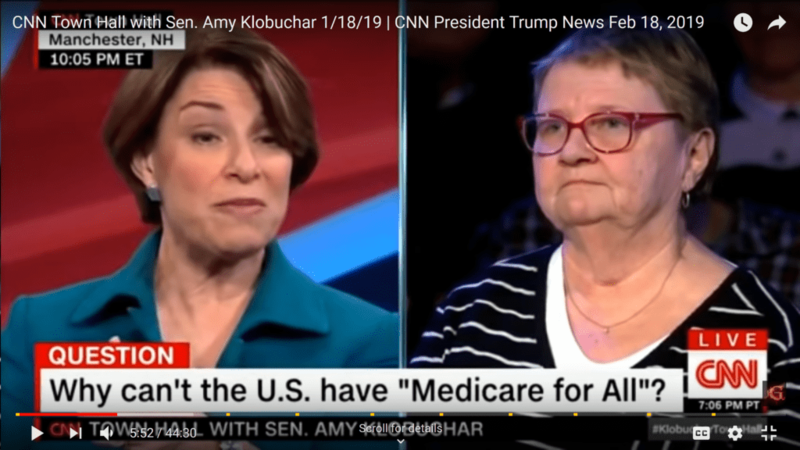 At a recent CNN town hall, Pam asked Senator Amy Klobuchar “Why can’t we have Medicare for All?” and her answer left a lot to be desired. In the months ahead, Pam will be asking more tough questions of presidential candidates, and other Rights & Democracy members will be doing the same. We need your help to raise critical funds to make sure Rights & Democracy is leading the narrative during the New Hampshire primary. Can you give $20 for 2020 to ensure our voices are strong and persistent throughout this primary? Rights & Democracy will be holding trainings around the state to equip our members with the skills they need to speak up and push candidates to take stances on the issues we care about – issues like Medicare for All, a fairer public education system, and the Green New Deal. Plus, we will be hosting The New Hampshire People’s Presidential Forum on October 13th, 2019! The forum is a partnership with People’s Action and New Hampshire Youth Movement. It will be unlike the traditional CNN or NBC debates because Granite Staters will be setting the agenda, asking the questions, and sharing our stories. It’s sure to be a great event! If you give $20 for 2020 and you’ll get a seat at the New Hampshire People’s Presidential Forum! Give as you can, $20 one time, or $20 a month. One-time contributions help us a lot, but we are especially thankful to people who can be monthly sustaining members. Monthly giving frees Rights & Democracy from grant funding and ensures we can budget and develop member-led programming on the issues that we care about.